Sign up for our 7 free tips. Start earning today. Your site looks like the first honest attempt to help people understand about online income. If you’re in urgent need of money & want to earn immediately, Writing articles online is one of the quickest ways to earn. It is free to join and you can start earning right now. The only skill you need is to know English. Freelance is where you get paid for completing a task. Most of the tasks are technical/creative in nature. So, if you’re ready to develop some technical/creative skills, choose freelancing. This is the ultimate way to earn money online. It starts with finding something that people want & creating it. This requires more effort, but the rewards are worth it as the earning potential is unlimited. How to get payments online? If you’re from India, you need to use PayPal to receive payments online. Once you receive the money in paypal, you can easily transfer it to any bank a/c of your choice. Watch the video to see how to create you paypal a/c in India for free. FastRupee was started with one goal in mind: To make online earning as simple as possible. Thousands of people in India are constantly looking to earn more income. But, most of the information about earning online is very vague and hard to understand. FastRupee aims to solve this by simplifying the information which can be understood by anyone and help them create an extra source of income. 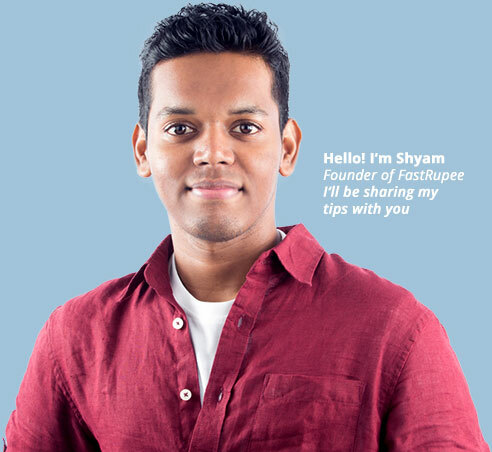 More than 80,000 people have subscribed to FastRupee to learn legitimate ways to earn online. Sign up for our 7 free tips & start earning today. Please check your email & confirm to receive the 1st Tip.